Hello, my name is Beth Cohen, Registered Nurse and the Secretary Treasurer of Health Professionals and Allied Employees Local 5105 which represents 1,000 Registered Nurses at Virtua Memorial Hospital. Thank you for the opportunity to address you today regarding the merger between Virtua Health and Lourdes Health System. HPAE supports this merger with several conditions outlined in my testimony. As nurses, we have an interest in the future of our health system and the impact this merger between Virtua and Lourdes will have on our community. After this merger Virtua Health will have a much larger portion of the market share within a 20-mile radius. It is critically important that through the Community Health Care Assets Protection Act, the Attorney General’s office does its due diligence, living up to the title of the act that regulates non-profit hospital mergers. The AG’s office must protect the health care assets of the communities served by the hospitals affected in this merger for the good of the citizens utilizing the services and for the good of the employees who provide the services. Because the Virtua – Lourdes deal is between two not-for-profit systems and there is no purchase or sale of assets, it is exempt from the Department of Health’s Certificate of Need review. Nevertheless, CHAPA requires the Attorney General to review this transaction “in consultation with the Commissioner of Health” to determine if it is “in the public interest.” As part of that review, the DOH Commissioner must determine whether “the proposed transaction is not likely to result in the deterioration of the quality, availability, or accessibility of health care services in the affected community.” We would ask that the letter sent from the Office of the Attorney General to the Superior Court supporting or opposing this acquisition include with specificity the steps that the DOH has taken and the evidence it has reviewed in order to make this required determination. CHAPA also provides that the Attorney General can place modifications or conditions on a transaction to more fully assure it is “in the public interest,” including assuring that access to services does not diminish and quality of care does not suffer. The Membership Transfer Agreement (MTA) states that the Lourdes Medical Center of Burlington County (LMCBC) will remain an acute care hospital and maintain core services only until December 31, 2023 or upon the opening of Virtua Health’s new hospital in Westhampton, New Jersey, whichever comes first. Further, in response to CHAPA request #49 as to how the communities within the service area of the Lourdes System will benefit from the proposed transaction, the response stated that consideration was being given to re-purposing LMCBC for inpatient behavioral health services and addiction treatment services. With the closure of LMCBC and Virtua Memorial’s move from Mt. Holly to Westhampton, there is credible potential for lost services. Since the DOH is not conducting a CN on this merger, HPAE requests the Attorney General to ensure that the merger maintains continuity and accessibility to all services. We ask the Attorney General to have conditions that place controls on possible consolidation to ensure that vital services do not become out of reach for patients. We appreciate that Virtua Health wants to provide greater access to addiction and behavioral health treatment, but we do not want that to happen at the expense of other hospital-provided services. 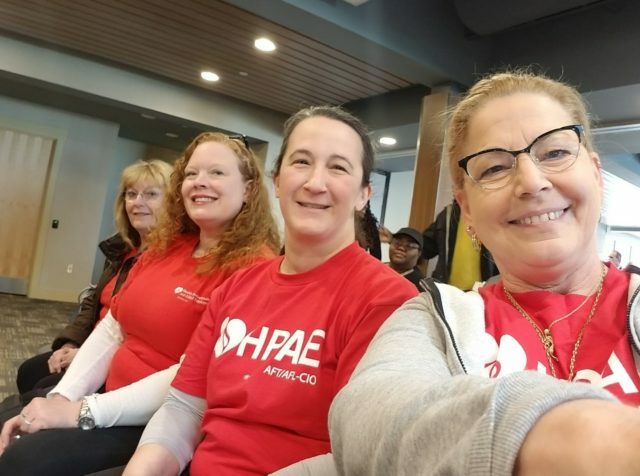 Maintaining the employee working conditions, rights, and benefits protected by the existing collective bargaining agreement between HPAE and Virtua Memorial enables our hospital to continue to recruit and retain highly qualified, experienced staff. Due to the gains we have made in our contract promoting patient safety, improving working conditions, wages, and benefits, the contract is integral to maintaining the quality and continuity of health care services in the communities served. We ask the Attorney General to incorporate a condition to this merger between Virtua and Lourdes to retain employees in good standing at the two Lourdes hospitals, despite the fact that they are not covered by an HPAE contract. Maintaining consistency of care at the Lourdes hospitals will be crucial to the success and morale of all workers as they join a new health system. We mention this because there seems to be no statement of maintaining employment status for “at-will” employees in the MTA. We request the Attorney General to support employment security for current Lourdes workers. This merger will make Virtua the largest health care provider in a roughly 20-mile radius. Based on past admissions, Virtua will have a market share of approximately 53% as compared to Cooper’s 25% and Jefferson’s 22% market shares. With a current Federal Trade Commission investigation ongoing, HPAE requests the Attorney General to consider how market share may affect prices, quality, and levels of services. Placing conditions accordingly to control what could be unintended harmful consequences to patients would be a service to the communities using these facilities. The Attorney General and the Department of Health have a legal and moral obligation to conduct a thorough review of all the documents, to make sure that access to services, availability of services, and maintenance of quality care are all protected. Both need to ascertain that this merger truly is in the best interest of the public. Thank you for your time and I urge you to incorporate these recommendations as part of any approval of this transaction. Membership Transfer Agreement between Maxis Health System, Trinity Health Corporation, and Virtua Health, Inc., 4 June 2018, p. 15. Response to CHAPA Request #49, Bates Stamp MAX08221. See Section 6.21(c) Employment Matters, Membership Transfer Agreement, p. 36.